The chalet is fully equipped for families, couples or groups up to six people. It consists of an entrance area and two floors. It has tiles and carpeted floors, wooden ceilings, painted walls and central floor heating. In the end of 2000 it was completely refurbished, including new kitchen and beds. 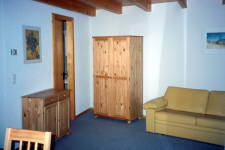 It is fully equipped for a self catering holiday. The entrance area has the necessary wardrobe and shoe-rack to leave your upper clothes and shoes. 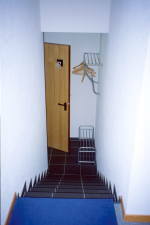 A door in front of the entrance gives access to small room for ski deposit during winter. A short stairway leads directly from the entrance area to the first floor. The first floor houses living and dining area, the kitchen, the bathroom, and access to the balcony. A second floor foresees everything necessary for comfortable sleeping. In the basement of the apartments next to the entrance door you will find a self-service laundry and a public telephone. Sufficient parking space is available at a 100 m distance. In summer you can drive till the front door to unload luggage. In the winter a ski-do (snowmobile) shuttle service is available for transport of luggage between the chalet and the parking space. Smoking is not permitted, pets are NOT allowed. Unfortunately, the chalet is unsuitable for wheelchair users.